Formally, an elliptic curve is a smooth, projective, algebraic curve of genus one, on which there is a specified point O. An elliptic curve is an abelian variety – that is, it has a multiplication defined algebraically, with respect to which it is an abelian group – and O serves as the identity element. 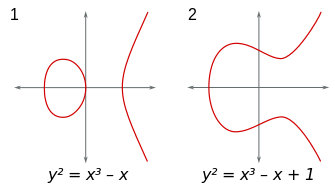 Often the curve itself, without O specified, is called an elliptic curve; the point O is often taken to be the curve's "point at infinity" in the projective plane. If y2 = P(x), where P is any polynomial of degree three in x with no repeated roots, the solution set is a nonsingular plane curve of genus one, an elliptic curve. If P has degree four and is square-free this equation again describes a plane curve of genus one; however, it has no natural choice of identity element. More generally, any algebraic curve of genus one, for example from the intersection of two quadric surfaces embedded in three-dimensional projective space, is called an elliptic curve, provided that it has at least one rational point to act as the identity. Using the theory of elliptic functions, it can be shown that elliptic curves defined over the complex numbers correspond to embeddings of the torus into the complex projective plane. The torus is also an abelian group, and in fact this correspondence is also a group isomorphism. Elliptic curves are especially important in number theory, and constitute a major area of current research; for example, they were used in the proof, by Andrew Wiles, of Fermat's Last Theorem. They also find applications in elliptic curve cryptography (ECC) and integer factorization. An elliptic curve is not an ellipse: see elliptic integral for the origin of the term. Topologically, a complex elliptic curve is a torus. Although the formal definition of an elliptic curve is fairly technical and requires some background in algebraic geometry, it is possible to describe some features of elliptic curves over the real numbers using only introductory algebra and geometry. where a and b are real numbers. This type of equation is called a Weierstrass equation. The (real) graph of a non-singular curve has two components if its discriminant is positive, and one component if it is negative. For example, in the graphs shown in figure to the right, the discriminant in the first case is 64, and in the second case is −368. When working in the projective plane, we can define a group structure on any smooth cubic curve. In Weierstrass normal form, such a curve will have an additional point at infinity, O, at the homogeneous coordinates [0:1:0] which serves as the identity of the group. Since the curve is symmetrical about the x-axis, given any point P, we can take −P to be the point opposite it. We take −O to be just O. If P and Q are two points on the curve, then we can uniquely describe a third point, P + Q, in the following way. First, draw the line that intersects P and Q. This will generally intersect the cubic at a third point, R. We then take P + Q to be −R, the point opposite R.
This definition for addition works except in a few special cases related to the point at infinity and intersection multiplicity. The first is when one of the points is O. Here, we define P + O = P = O + P, making O the identity of the group. Next, if P and Q are opposites of each other, we define P + Q = O. Lastly, if P = Q we only have one point, thus we can't define the line between them. In this case, we use the tangent line to the curve at this point as our line. In most cases, the tangent will intersect a second point R and we can take its opposite. However, if P happens to be an inflection point (a point where the concavity of the curve changes), we take R to be P itself and P + P is simply the point opposite itself. For a cubic curve not in Weierstrass normal form, we can still define a group structure by designating one of its nine inflection points as the identity O. In the projective plane, each line will intersect a cubic at three points when accounting for multiplicity. For a point P, −P is defined as the unique third point on the line passing through O and P. Then, for any P and Q, P + Q is defined as −R where R is the unique third point on the line containing P and Q. Let K be a field over which the curve is defined (i.e., the coefficients of the defining equation or equations of the curve are in K) and denote the curve by E. Then the K-rational points of E are the points on E whose coordinates all lie in K, including the point at infinity. The set of K-rational points is denoted by E(K). It, too, forms a group, because properties of polynomial equations show that if P is in E(K), then −P is also in E(K), and if two of P, Q, and R are in E(K), then so is the third. Additionally, if K is a subfield of L, then E(K) is a subgroup of E(L). Since K is a field, s is well-defined. The line equation and the curve equation have an identical y in the points xP, xQ, and xR. An elliptic curve over the complex numbers is obtained as a quotient of the complex plane by a lattice Λ, here spanned by two fundamental periods ω1 and ω2. The four-torsion is also shown, corresponding to the lattice 1/4 Λ containing Λ. This map is a group isomorphism of the torus (considered with its natural group structure) with the chord-and-tangent group law on the cubic curve which is the image of this map. It is also an isomorphism of Riemann surfaces from the torus to the cubic curve, so topologically, an elliptic curve is a torus. If the lattice Λ is related by multiplication by a non-zero complex number c to a lattice cΛ, then the corresponding curves are isomorphic. Isomorphism classes of elliptic curves are specified by the j-invariant. Here, λ is sometimes called the modular lambda function. Note that the uniformization theorem implies that every compact Riemann surface of genus one can be represented as a torus. 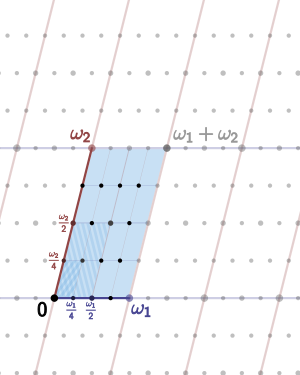 for a and b integers in the range from 0 to n−1. Over the complex numbers, every elliptic curve has nine inflection points. Every line through two of these points also passes through a third inflection point; the nine points and 12 lines formed in this way form a realization of the Hesse configuration. A curve E defined over the field of rational numbers is also defined over the field of real numbers. Therefore, the law of addition (of points with real coordinates) by the tangent and secant method can be applied to E. The explicit formulae show that the sum of two points P and Q with rational coordinates has again rational coordinates, since the line joining P and Q has rational coefficients. This way, one shows that the set of rational points of E forms a subgroup of the group of real points of E. As this group, it is an abelian group, that is, P + Q = Q + P.
The most important result is that all points can be constructed by the method of tangents and secants starting with a finite number of points. More precisely the Mordell–Weil theorem states that the group E(Q) is a finitely generated (abelian) group. By the fundamental theorem of finitely generated abelian groups it is therefore a finite direct sum of copies of Z and finite cyclic groups. The proof of that theorem rests on two ingredients: first, one shows that for any integer m > 1, the quotient group E(Q)/mE(Q) is finite (weak Mordell–Weil theorem). Second, introducing a height function h on the rational points E(Q) defined by h(P0) = 0 and h(P) = log max(|p|, |q|) if P (unequal to the point at infinity P0) has as abscissa the rational number x = p/q (with coprime p and q). This height function h has the property that h(mP) grows roughly like the square of m. Moreover, only finitely many rational points with height smaller than any constant exist on E.
The proof of the theorem is thus a variant of the method of infinite descent and relies on the repeated application of Euclidean divisions on E: let P ∈ E(Q) be a rational point on the curve, writing P as the sum 2P1 + Q1 where Q1 is a fixed representant of P in E(Q)/2E(Q), the height of P1 is about 1/4 of the one of P (more generally, replacing 2 by any m > 1, and 1/4 by 1/m2). Redoing the same with P1, that is to say P1 = 2P2 + Q2, then P2 = 2P3 + Q3, etc. finally expresses P as an integral linear combination of points Qi and of points whose height is bounded by a fixed constant chosen in advance: by the weak Mordell–Weil theorem and the second property of the height function P is thus expressed as an integral linear combination of a finite number of fixed points. So far, the theorem is not effective since there is no known general procedure for determining the representants of E(Q)/mE(Q). It has rank 19, found by Noam Elkies in 2009. Curves of rank at least 28 are known, but their rank is not exactly known. As for the groups constituting the torsion subgroup of E(Q), the following is known: the torsion subgroup of E(Q) is one of the 15 following groups (a theorem due to Barry Mazur): Z/NZ for N = 1, 2, ..., 10, or 12, or Z/2Z × Z/2NZ with N = 1, 2, 3, 4. Examples for every case are known. Moreover, elliptic curves whose Mordell–Weil groups over Q have the same torsion groups belong to a parametrized family. The Birch and Swinnerton-Dyer conjecture (BSD) is one of the Millennium problems of the Clay Mathematics Institute. The conjecture relies on analytic and arithmetic objects defined by the elliptic curve in question. At the analytic side, an important ingredient is a function of a complex variable, L, the Hasse–Weil zeta function of E over Q. This function is a variant of the Riemann zeta function and Dirichlet L-functions. It is defined as an Euler product, with one factor for every prime number p.
, reducing the coefficients modulo p defines an elliptic curve over the finite field Fp (except for a finite number of primes p, where the reduced curve has a singularity and thus fails to be elliptic, in which case E is said to be of bad reduction at p). where ε(p) = 1 if E has good reduction at p and 0 otherwise (in which case ap is defined differently from the method above: see Silverman (1986) below). This product converges for Re(s) > 3/2 only. Hasse's conjecture affirms that the L-function admits an analytic continuation to the whole complex plane and satisfies a functional equation relating, for any s, L(E, s) to L(E, 2 − s). In 1999 this was shown to be a consequence of the proof of the Shimura–Taniyama–Weil conjecture, which asserts that every elliptic curve over Q is a modular curve, which implies that its L-function is the L-function of a modular form whose analytic continuation is known. One can therefore speak about the values of L(E, s) at any complex number s. The Birch–Swinnerton-Dyer conjecture relates the arithmetic of the curve to the behavior of its L-function at s = 1. More precisely, it affirms that the order of the L-function at s = 1 equals the rank of E and predicts the leading term of the Laurent series of L(E, s) at that point in terms of several quantities attached to the elliptic curve. has a rational point of infinite order (thus, under the Birch and Swinnerton-Dyer conjecture, its L-function has a zero at 1). The interest in this statement is that the condition is easily verified. defines a parabolic modular newform of weight 2 and level N. For prime numbers ℓ not dividing N, the coefficient a(ℓ) of the form equals ℓ minus the number of solutions of the minimal equation of the curve modulo ℓ. For prime numbers ℓ not equal to 37, one can verify the property about the coefficients. Thus, for ℓ = 3, there are 6 solutions of the equation modulo 3: (0, 0), (0, 1), (2, 0), (1, 0), (1, 1), (2, 1); thus a(3) = 3 − 6 = −3. The conjecture, going back to the 1950s, was completely proven by 1999 using ideas of Andrew Wiles, who proved it in 1994 for a large family of elliptic curves. There are several formulations of the conjecture. Showing that they are equivalent is difficult and was a main topic of number theory in the second half of the 20th century. The modularity of an elliptic curve E of conductor N can be expressed also by saying that there is a non-constant rational map defined over Q, from the modular curve X0(N) to E. In particular, the points of E can be parametrized by modular functions. and likewise for y(z) for all integers a, b, c, d with ad − bc = 1 and 37|c. Another formulation depends on the comparison of Galois representations attached on the one hand to elliptic curves, and on the other hand to modular forms. The latter formulation has been used in the proof the conjecture. Dealing with the level of the forms (and the connection to the conductor of the curve) is particularly delicate. cannot be modular. Thus, the proof of the Taniyama–Shimura–Weil conjecture for this family of elliptic curves (called Hellegouarch–Frey curves) implies FLT. The proof of the link between these two statements, based on an idea of Gerhard Frey (1985), is difficult and technical. It was established by Kenneth Ribet in 1987. This section is concerned with points P = (x, y) of E such that x is an integer. The following theorem is due to C. L. Siegel: the set of points P = (x, y) of E(Q) such that x is an integer is finite. This theorem can be generalized to points whose x coordinate has a denominator divisible only by a fixed finite set of prime numbers. (x, y) = (−1, 4), (−2, 3), (2, 5), (4, 9), (8, 23), (43, 282), (52, 375), (7003523400000000000♠5234, 7005378661000000000♠378661). (x, y) = (0, 0), (−1, 1), (2, 2), (338, 7003621400000000000♠6214). As for the integral points, Siegel's theorem generalizes to the following: Let E be an elliptic curve defined over a number field K, x and y the Weierstrass coordinates. Then there are only finitely many points of E(K) whose x-coordinate is in the ring of integers OK. The properties of the Hasse–Weil zeta function and the Birch and Swinnerton-Dyer conjecture can also be extended to this more general situation. Elliptic curves can be defined over any field K; the formal definition of an elliptic curve is a non-singular projective algebraic curve over K with genus 1 and endowed with a distinguished point defined over K.
provided that the variety it defines is non-singular. If characteristic were not an obstruction, each equation would reduce to the previous ones by a suitable change of variables. One typically takes the curve to be the set of all points (x,y) which satisfy the above equation and such that both x and y are elements of the algebraic closure of K. Points of the curve whose coordinates both belong to K are called K-rational points. Let E and D be elliptic curves over a field k. An isogeny between E and D is a finite morphism f : E → D of varieties that preserves basepoints (in other words, maps the given point on E to that on D). The two curves are called isogenous if there is an isogeny between them. This is an equivalence relation, symmetry being due to the existence of the dual isogeny. Every isogeny is an algebraic homomorphism and thus induces homomorphisms of the groups of the elliptic curves for k-valued points. Set of affine points of elliptic curve y2 = x3 − x over finite field F61. In other words, the number of points of the curve grows roughly as the number of elements in the field. This fact can be understood and proven with the help of some general theory; see local zeta function, Étale cohomology. Set of affine points of elliptic curve y2 = x3 − x over finite field F89. over F71 has 72 points (71 affine points including (0,0) and one point at infinity) over this field, whose group structure is given by Z/2Z × Z/36Z. The number of points on a specific curve can be computed with Schoof's algorithm. Set of affine points of elliptic curve y2 = x3 − x over finite field F71. in Hasse's theorem varies with the different primes q, if an elliptic curve E over Q is reduced modulo q. It was proven (for almost all such curves) in 2006 due to the results of Taylor, Harris and Shepherd-Barron, and says that the error terms are equidistributed. Elliptic curves over finite fields are notably applied in cryptography and for the factorization of large integers. These algorithms often make use of the group structure on the points of E. Algorithms that are applicable to general groups, for example the group of invertible elements in finite fields, F*q, can thus be applied to the group of points on an elliptic curve. For example, the discrete logarithm is such an algorithm. The interest in this is that choosing an elliptic curve allows for more flexibility than choosing q (and thus the group of units in Fq). Also, the group structure of elliptic curves is generally more complicated. ^ See also J. W. S. Cassels, Mordell's Finite Basis Theorem Revisited, Mathematical Proceedings of the Cambridge Philosophical Society 100, 3–41 and the comment of A. Weil on the genesis of his work: A. Weil, Collected Papers, vol. 1, 520–521. ^ Dujella, Andrej. "History of elliptic curves rank records". University of Zagreb. ^ The definition is formal, the exponential of this power series without constant term denotes the usual development. ^ D. R. Heath-Brown, The average analytic rank of elliptic curves, Duke Mathematical Journal 122–3, 591–623 (2004). ^ For the calculations, see for example D. Zagier, « Modular points, modular curves, modular surfaces and modular forms », Lecture Notes in Mathematics 1111, Springer, 1985, 225–248. ^ D. Zagier, « Modular points, modular curves, modular surfaces and modular forms », Lecture Notes in Mathematics 1111, Springer, 1985, 225–248. ^ Ribet, Ken (1990). "On modular representations of Gal(Q/Q) arising from modular forms" (PDF). Inventiones Mathematicae. 100 (2): 431–476. doi:10.1007/BF01231195. MR 1047143. ^ See the survey of K. Ribet «From the Taniyama–Shimura conjecture to Fermat's Last Theorem», Annales de la Faculté des sciences de Toulouse 11 (1990), 116–139. ^ Silverman 1986, Theorem IX.5.8., due to Baker. ^ T. Nagell, L'analyse indéterminée de degré supérieur, Mémorial des sciences mathématiques 39, Paris, Gauthier-Villars, 1929, pp. 56–59. ^ Siksek, Samir (1995), Descents on Curves of Genus I (PDF), Ph.D. thesis, University of Exeter, pp. 16–17 . ^ Merel, L. (1996). "Bornes pour la torsion des courbes elliptiques sur les corps de nombres". Inventiones Mathematicae (in French). 124 (1–3): 437–449. doi:10.1007/s002220050059. Zbl 0936.11037. ^ Harris, M.; Shepherd-Barron, N.; Taylor, R. (2010). "A family of Calabi–Yau varieties and potential automorphy". Annals of Mathematics. 171 (2): 779–813. doi:10.4007/annals.2010.171.779. Serge Lang, in the introduction to the book cited below, stated that "It is possible to write endlessly on elliptic curves. (This is not a threat.)" The following short list is thus at best a guide to the vast expository literature available on the theoretical, algorithmic, and cryptographic aspects of elliptic curves. I. Blake; G. Seroussi; N. Smart (2000). Elliptic Curves in Cryptography. LMS Lecture Notes. Cambridge University Press. ISBN 0-521-65374-6. Richard Crandall; Carl Pomerance (2001). "Chapter 7: Elliptic Curve Arithmetic". Prime Numbers: A Computational Perspective (1st ed.). Springer-Verlag. pp. 285–352. ISBN 0-387-94777-9. Cremona, John (1997). Algorithms for Modular Elliptic Curves (2nd ed.). Cambridge University Press. ISBN 0-521-59820-6. Darrel Hankerson, Alfred Menezes and Scott Vanstone (2004). Guide to Elliptic Curve Cryptography. Springer. ISBN 0-387-95273-X. Hellegouarch, Yves (2001). Invitation aux mathématiques de Fermat-Wiles. Paris: Dunod. ISBN 978-2-10-005508-1. Husemöller, Dale (2004). Elliptic Curves. Graduate Texts in Mathematics. 111 (2nd ed.). Springer. ISBN 0-387-95490-2. Kenneth Ireland; Michael I. Rosen (1998). "Chapters 18 and 19". A Classical Introduction to Modern Number Theory. Graduate Texts in Mathematics. 84 (2nd revised ed.). Springer. ISBN 0-387-97329-X. Anthony W. Knapp (1992). Elliptic Curves. Math Notes. 40. Princeton University Press. Koblitz, Neal (1993). Introduction to Elliptic Curves and Modular Forms. Graduate Texts in Mathematics. 97 (2nd ed.). Springer-Verlag. ISBN 0-387-97966-2. Koblitz, Neal (1994). "Chapter 6". A Course in Number Theory and Cryptography. Graduate Texts in Mathematics. 114 (2nd ed.). Springer-Verlag. ISBN 0-387-94293-9. Serge Lang (1978). Elliptic curves: Diophantine analysis. Grundlehren der mathematischen Wissenschaften. 231. Springer-Verlag. ISBN 3-540-08489-4. Henry McKean; Victor Moll (1999). Elliptic curves: function theory, geometry and arithmetic. Cambridge University Press. ISBN 0-521-65817-9. Ivan Niven; Herbert S. Zuckerman; Hugh Montgomery (1991). "Section 5.7". An introduction to the theory of numbers (5th ed.). John Wiley. ISBN 0-471-54600-3. Silverman, Joseph H. (1986). The Arithmetic of Elliptic Curves. Graduate Texts in Mathematics. 106. Springer-Verlag. ISBN 0-387-96203-4. Joseph H. Silverman (1994). Advanced Topics in the Arithmetic of Elliptic Curves. Graduate Texts in Mathematics. 151. Springer-Verlag. ISBN 0-387-94328-5. Joseph H. Silverman; John Tate (1992). Rational Points on Elliptic Curves. Springer-Verlag. ISBN 0-387-97825-9. John Tate (1974). "The arithmetic of elliptic curves". Inventiones Mathematicae. 23 (3–4): 179–206. doi:10.1007/BF01389745. Lawrence Washington (2003). Elliptic Curves: Number Theory and Cryptography. Chapman & Hall/CRC. ISBN 1-58488-365-0. Wikimedia Commons has media related to Elliptic curve. Weisstein, Eric W. "Elliptic Curves". MathWorld. Matlab code for implicit function plotting – can be used to plot elliptic curves. Interactive elliptic curve over R and over Zp – web application that requires HTML5 capable browser. This article incorporates material from Isogeny on PlanetMath, which is licensed under the Creative Commons Attribution/Share-Alike License.